The Food and Drug Administration (FDA) announced today (04/24/2015) that Inventure Food Inc. has issued a voluntary recall of its Fresh FrozenTM vegetables and Jamba® “at home” smoothie kits. The Food and Drug Administration (FDA) announced today (04/24/2015) that Inventure Food Inc. has issued a voluntary recall of its Fresh FrozenTM vegetables and Jamba® “at home” smoothie kits. This recall pertains to certain varieties of frozen vegetables and some specific “at home” Jamba smoothie kits only. The recall was initiated because of the detection of Listeria monocytogenes in Inventure Foods’ Jefferson, Arkansas facility during a routine check. According to the FDA website, there have been no Listeria monocytogenes detected in the recalled products and Inventure Foods initiated the recall/s “to err on the side of utmost caution.” No illnesses have been reported related to consumption of these products. Alabama, Arizona, Arkansas, Florida, Georgia, Illinois, Indiana, Kansas, Kentucky, Louisiana, Maryland, Michigan, Mississippi, Nebraska, North Carolina, Ohio, Oklahoma, South Carolina, Tennessee, Texas, Virginia, West Virginia and Wisconsin. Listeriosis is a serious infection caused by consuming food contaminated with the bacterium, and the Centers for Disease Control and Prevention (CDC) states that it is an important public health problem in the United States. Of the estimated 1600 people who get infected each year in the USA, death occurs in 260 cases. The CDC states that in rare cases, persons without the above-mentioned risk factors could also get affected. Pregnant women are ten times more likely to get infected with Listeria than the general population. The risk is even higher for pregnant Hispanic women, as they are 24 times more likely to get Listeria infection. The symptoms are usually non-specific like fatigue, muscle aches, etc., although fever can also occur. Listeria infection during pregnancy could potentially lead to miscarriage, pre-term labor, stillbirth, or serious infection in the newborn. If you are pregnant and think you might have been exposed to Listeria contaminated food, please consult your doctor immediately. 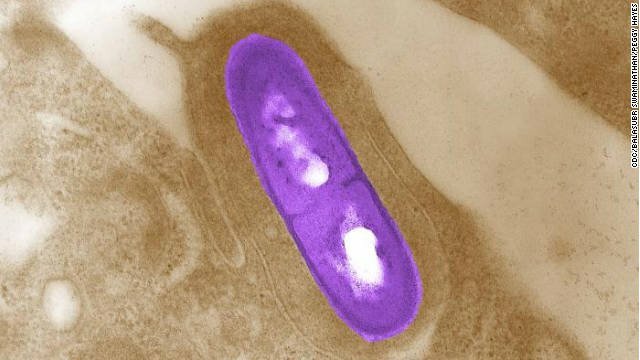 Unlike most bacteria, Listeria can grow and multiply in some foods in the refrigerator. If you suspect contaminated food, please discard. Scallan, E., Hoekstra, R., Angulo, F., Tauxe, R., Widdowson, M., Roy, S., . . . Griffin, P. (2011). Foodborne Illness Acquired in the United States—Major Pathogens. Emerging Infectious Diseases, 17(1), 7-15. Centers for Disease Control and Prevention. Vital signs: listeria illnesses, deaths, and outbreaks - United States, 2009-2011. MMWR Morbidity and mortality weekly report. 2013, 62(22): 448-52.